You’ve carved out some money in your budget that you earmark as “savings.” That’s a great first step. You also have a long list of savings goals. Your 10th anniversary is coming up. Your kids are going to college soon. You want to retire. You need to replace your car. How do you juggle all these savings goals? Here are a few pointers. Regardless of how important your other goals are, building an emergency fund should always come first. An emergency fund is money that you set aside for worst-case-scenarios. If you get laid off from work, if your car’s engine breaks or if your home’s furnace explodes, this emergency fund will save the day. It’s your safety net. Many people make the mistake of thinking that their credit card should be used for emergencies. Credit cards should never be used as a safety net. Credit card debt creates problems; it doesn’t solve problems. 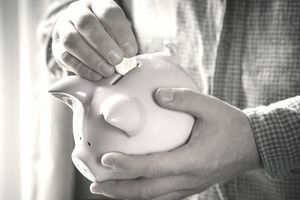 Experts disagree about how much money you should set aside for emergencies, but the consensus is that you should save 3 to 6 months of living expenses. Some experts believe you should save as much as 9 to 12 months of expenses, especially if you’re self-employed or if your job is in jeopardy. Retirement savings is nearly tied with an emergency fund as your highest-priority savings goal. Many parents make the mistake of prioritizing saving for their children’s college fund instead of saving for their retirement. While it’s natural to want to pay for your kids’ college, this is a huge mistake. Your children are young; they have their entire lives ahead of them to repay their loans and save for their retirement. You—as a parent—do not have this luxury. You have a tight time horizon to prepare for retirement. Repaying your credit cards is crucial to good financial health. Credit card repayment should be above all other goals, except for your emergency fund and your retirement. If you have high-interest credit card debt, you should keep a minimum of $1,000 on hand in an emergency fund and save at least a baseline amount towards your retirement. Apply the rest of your savings towards repaying your credit card debt. If you're not budgeting yet, learn how to create your first budget so that you can track all of these goals. Some experts disagree with the $1,000 suggestion. They argue that even people with high-interest credit card debt should save 3 to 6 months of living expenses before they repay their debts. If you have credit card debt, you should choose whichever option helps you sleep easiest at night. Save a minimum of $1,000 in an emergency fund or a maximum of 6 months of living costs. Once you’ve built an emergency fund, saved for retirement and repaid your existing debts, your next priority should be to save for any event that might cause you to go into debt in the future. You know that you’ll eventually need to replace your car. Start saving so you can buy your next car in cash—rather than taking out a car loan—by making monthly “car payments” to yourself. Let’s say you’re in the habit of making a $200 monthly payment on your car loan. Once you finish paying off your car, continue making a $200 monthly payment—except now, you'll be paying yourself. Direct the money into a special savings account that you earmark for buying your next car. If you’re a homeowner, you’ll need to eventually replace your roof, your carpets and your major appliances like your refrigerator, washer, and dryer. Instead of financing these purchases, start a fund to save for these once-a-decade expenses. If you would be willing to go into debt to pay for your wedding, start saving for it immediately—even if you haven’t met that special someone yet. Try this interactive worksheet that helps you save for the "fun" stuff.